The unique and versatile hexagon shaped concrete bench a modern accent to landscape spaces. This distinctive shape and size creates the opportunities for this hexagon structure to be used as a bench, bollard or table. The clean, smooth lines and a featured reveal band that enhances the geometric shape, creating a subtle expression. This multi-functional, security ready, hexagon bench is constructed entirely with steel rebar reinforced ASTM compliant concrete. 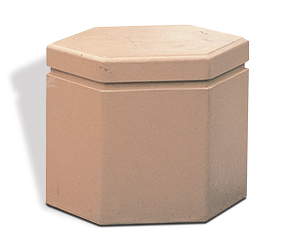 Popular for providing the durability demanded from a variety of heavy traffic areas. Available in standard and premium selection of finish and color options to meet that demand.